Psalm 24 is a majestic song of praise to the King of glory. It concludes with a herald’s announcement of the King’s approach: “Lift up your heads, you gates; lift them up, you ancient doors, that the King of glory may come in. Who is he, this King of glory? The Lord Almighty—he is the King of glory” (Psalm 24:9-10 NIV). As this hymn is sung, contemplate how we can prepare our hearts for Christ’s Second Coming. Georg Weissel, a seventeenth-century German pietist, is the author of the original text for this hymn based on Psalm 24. Written for the first Sunday of Advent, it was first published in Preussiche Fest-Lieder in 1642. Catherine Winkworth translated it into English and published it in her Lyra Germanica in 1855. 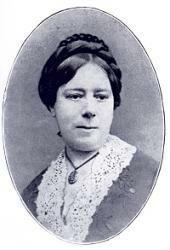 She revised her translation for publication in her Chorale Book for England in 1863. Both the German original and Winkworth’s translation were in five eight-line stanzas in the meter 8.8.8.8.8.8.6.6. Since Winkworth’s translations were published, many different versions have appeared. Sometimes each stanza is divided into two four-line stanzas of 8.8.8.8, for which the last two lines of each eight-line stanza are revised to fit the meter. Hymnals with eight-line stanzas tend to include all five, but those with four-line stanzas usually use less than half of the full text. While the first four lines of the hymn are always included, the only parts of the remaining text that are often used are the original fourth and fifth stanzas. The declaration of the glory of God the King is the main theme of this hymn. The fifth of the original stanzas is a prayer addressed to God asking for His presence in one’s heart. There are several tunes to choose from in singing this hymn. The most common choice is TRURO, an anonymous tune first published in 1789 in Psalmodia Evangelica by Thomas Williams. It has been attributed to several people, including George F. Handel, but no definite evidence has been found for such claims. This tune is named after a city in Cornwall, but there is no known connection between the two. This tune is in the shorter meter, as is WAREHAM. The second most popular tune is MACHT HOCH DIE TÜR, named after the German text of the hymn. It is in the longer meter, like the original text of the hymn and the alternate tune MILWAUKEE. An interesting fact is that Lutheran hymnals that include this hymn tend to have two settings, one for each of these longer tunes. 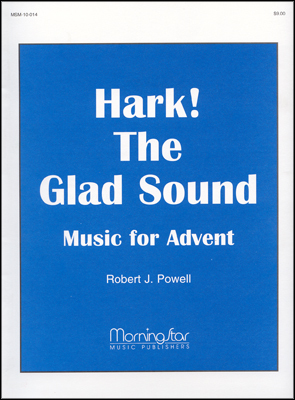 This hymn was originally written for Advent, but is also used for Palm Sunday. In either season, this hymn is appropriate for hailing the coming of King Jesus. 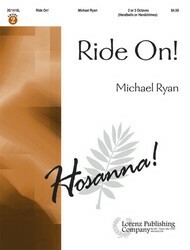 Two instrumental arrangements designed for these seasons are “Ride On!”, a medley of three Palm Sunday tunes for handbells or handchimes with TRURO, and the arrangement of MACHT HOCH DIE TÜR in “Seven Christmas Fantasias for Piano with Violin.” To add interest to congregational accompaniment, “Introductions, Interludes, and Codas, set 4” for organ includes two settings of MILWAUKEE and one of WAREHAM. 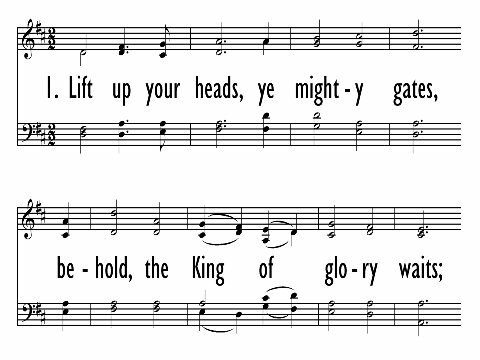 A choral arrangement that fully exploits the majestic theme of the hymn is “He Is the King of Glory,” which combines two texts based on Psalm 24 – this hymn (set to TRURO) and George F. Handel’s majestic chorus “Lift Up Your Heads” from Messiah, which has the same opening rhythmic motif as TRURO.